Spring is here and the weather has been sunny and warm for the most part. That means that we’ve dusted off the grill and started cooking outside. I love cooking on the grill because there is much less mess to clean up but sometimes it’s hard cleaning up those grill tools. It seems that because of the high heat of the outdoor grill the sauces from the meat get baked on to our grill tools. That’s why I’m glad we always have the green Scotch-Brite® Heavy Duty Scrub Sponges on hand to help with cleaning up after grilling. 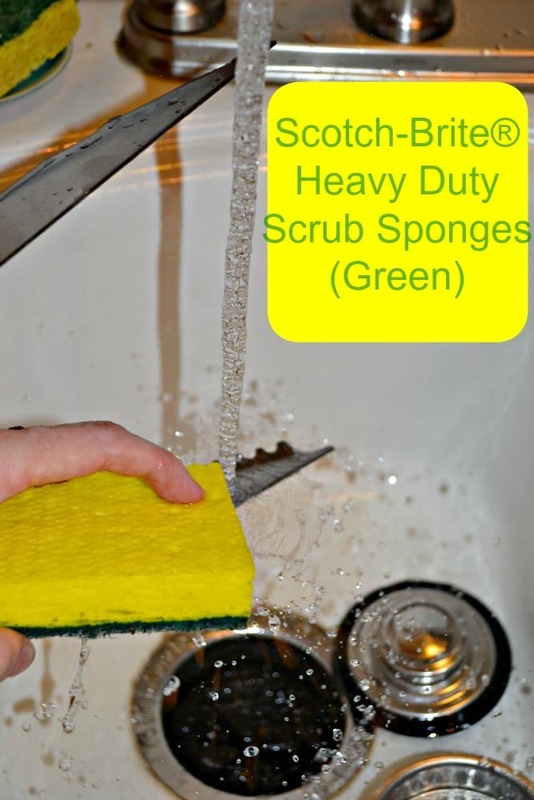 We get our Scotch-Brite® Heavy Duty Scrub Sponges at Kroger and they are great for removing tough, baked-on messes 50% faster than other competitive sponges. They also work well on pots, pans, oven racks, and the grill. I use these sponges to clean both the grill racks and the grill tools after grilling meat with a sticky sauce. It makes clean up easy. 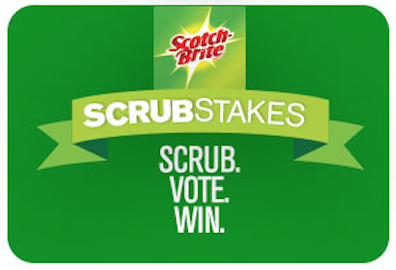 Plus right now you can enter to win the Scotch-Brite™ Scrubstakes where you can win $20,000 towards a kitchen makeover! Who couldn’t use a kitchen makeover? Simply choose if you are #TeamSponge or #TeamDishCloth. I’m sure you can tell but I’m 100% #TeamSponge! So what type of recipes do I make on the grill? One of my favorites is grilled BBQ Ribs. While baking ribs is fine, there’s nothing quite like BBQ Ribs on the grill. I like to start the ribs in the oven and then finish them off on the grill. It leaves them super tender and gives them a bit of a smokey flavor. The only thing I have to think about is which sauce to use on them. 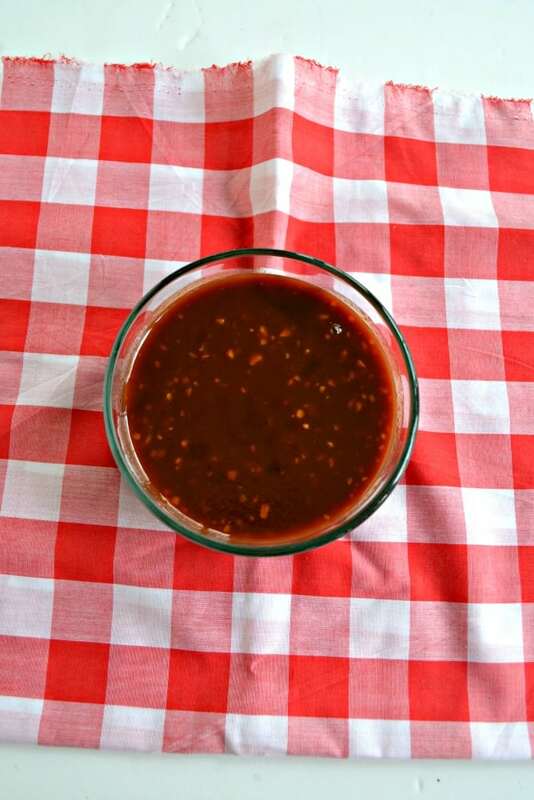 This time around I made my Bourbon BBQ Sauce. This sauce is sweet, tangy, and a little bit spicy. It has a subtle bourbon flavor as well. 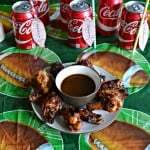 It’s really delicious on Grilled Ribs because the sauce gets thick and sticks to each rib which makes for even better ribs. In order to make the Bourbon BBQ Ribs I first have to make the BBQ sauce. This takes place inside. While you can certainly use a store bought sauce, it’s so easy to make homemade sauce and you can tailor it to your family’s tastes. 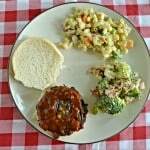 My family likes sweet, tangy, and spicy so that’s why I use brown sugar, Sriracha, and balsamic vinegar in my BBQ recipe. To make the sauce I simply had to place everything in a saucepan and boil it. It’s that easy! Plus you can make it a day ahead of time and refrigerate it. That’s what I like to do so I have time to clean up after making the sauce. The downside to a great BBQ sauce is the mess it leaves both on the stove and in the pan. But don’t worry, there’s a sponge for that too! 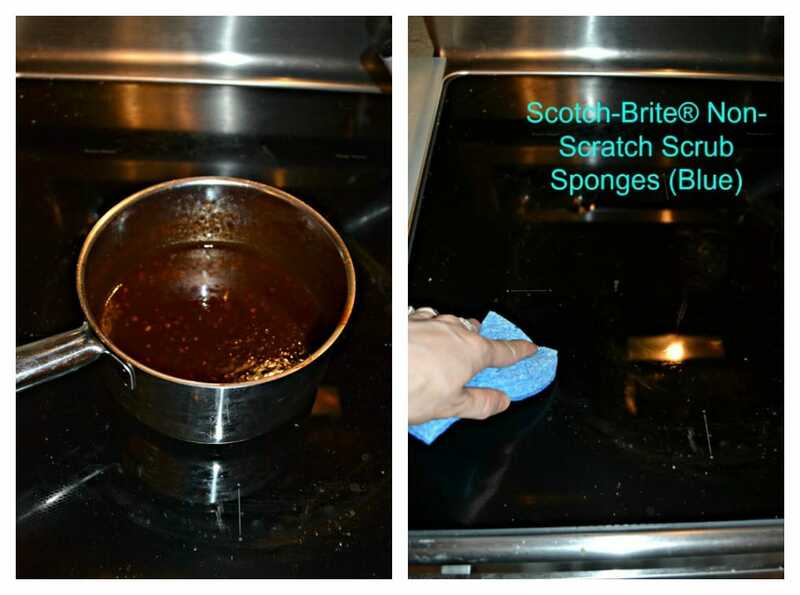 The blue Scotch-Brite® Non-Scratch Scrub Sponge is perfect for cleaning non-stick cookware, counter tops, and cook tops. This means it’s easy for me to grab it and scrub the sauce off of our glass cook top without worrying about scratching it up. 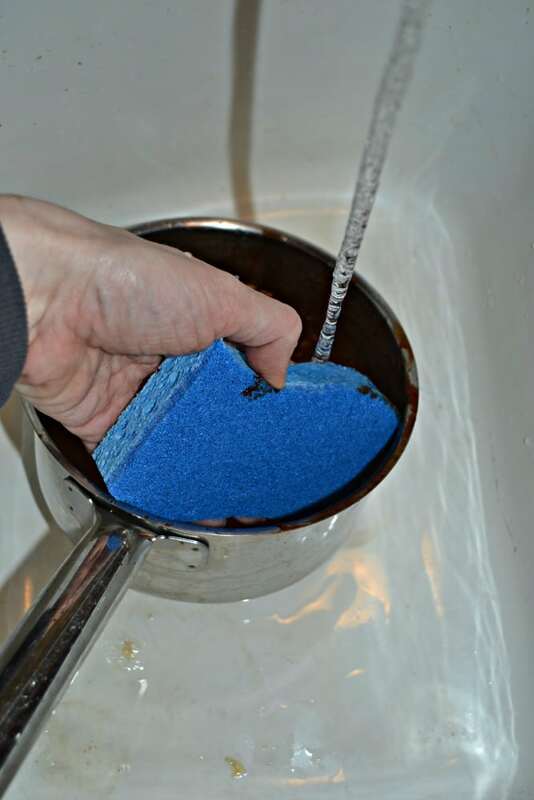 I can then take the same sponge to the sink to help me clean the saucepan. 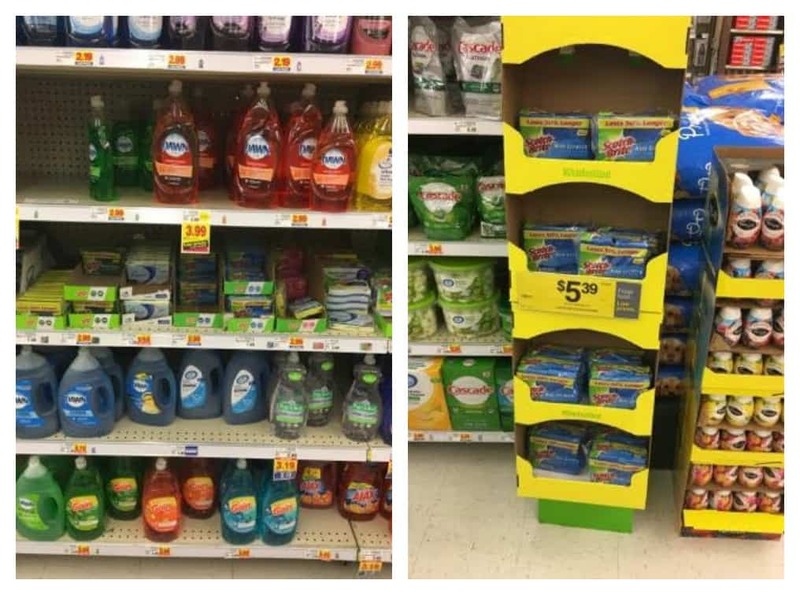 We actually keep Scotch-Brite® sponges in the kitchen, the basement, and both of our bathrooms because they are great for cleaning just about anything! Want to try them for yourself? 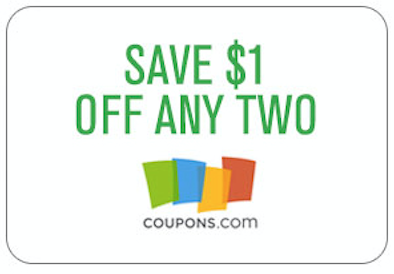 Click on the Coupons.com photo below to save $1.00 when you buy 2 Scotch-Brite® sponges. After making the sauce it’s time to pre-bake the ribs in the oven. I usually do this for about an hour and then it’s time to fire up the grill and put on the ribs. I like to grill them for a few minutes without anything on them and then I begin using the Bourbon BBQ Sauce to baste the ribs while they cook. This means every ten minutes or so I’ll open up the grill and brush on a new coat of sauce until the ribs are finished. Once the ribs are finished I generally will bring the remaining BBQ Sauce to a boil on the stove and then I’ll serve it on the side of the ribs. 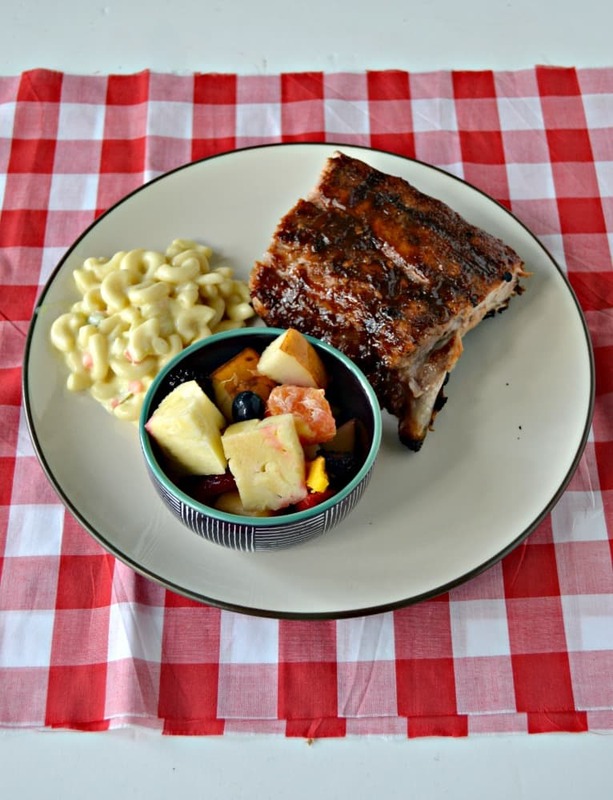 We like to eat our ribs with macaroni salad, baked beans, and fruit salad. It’s the perfect recipe to enjoy on a warm day. 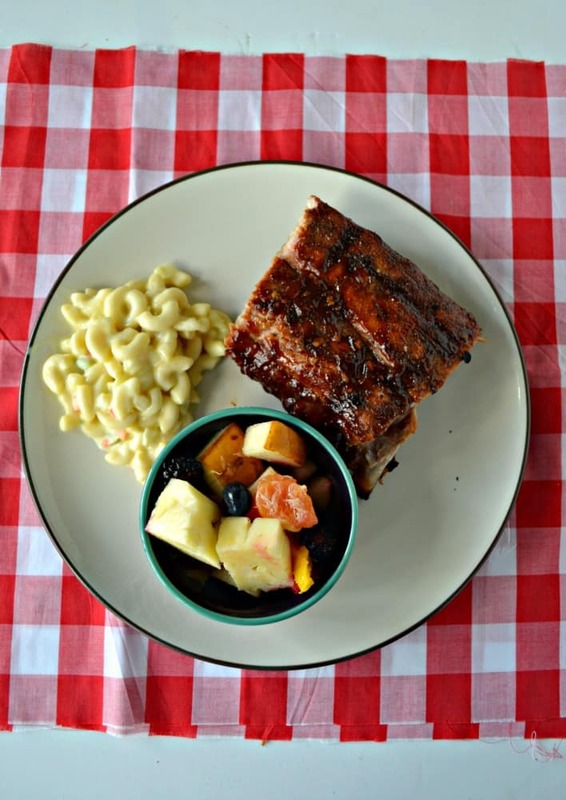 Enjoy these grilled ribs with a sweet, spicy, and tangy Bourbon BBQ Sauce! Place all the sauce ingredients in a medium saucepan over medium high heat. Bring the sauce to a boil then reduce heat and simmer for 15 minutes or until the sauce is thick. Remove from heat. Rub the ribs with salt, pepper, and garlic powder. Place in a large baking dish along with 1 cup of water. Cover and bake for 1 hour. 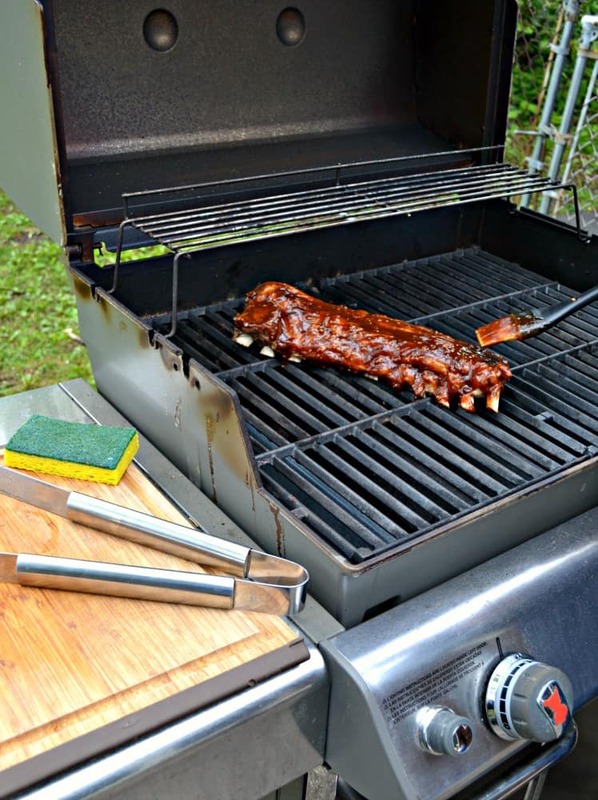 Place the ribs on the top rack of the grill with the meat side up and close the lid. Lower the heat to low and allow to cook for 30 minutes. 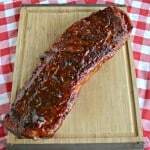 After 30 minutes place the ribs on the lower rack of the grill, meat side down, and brush the ribs with prepared BBQ sauce. Close the lid and cook for 10 minutes. 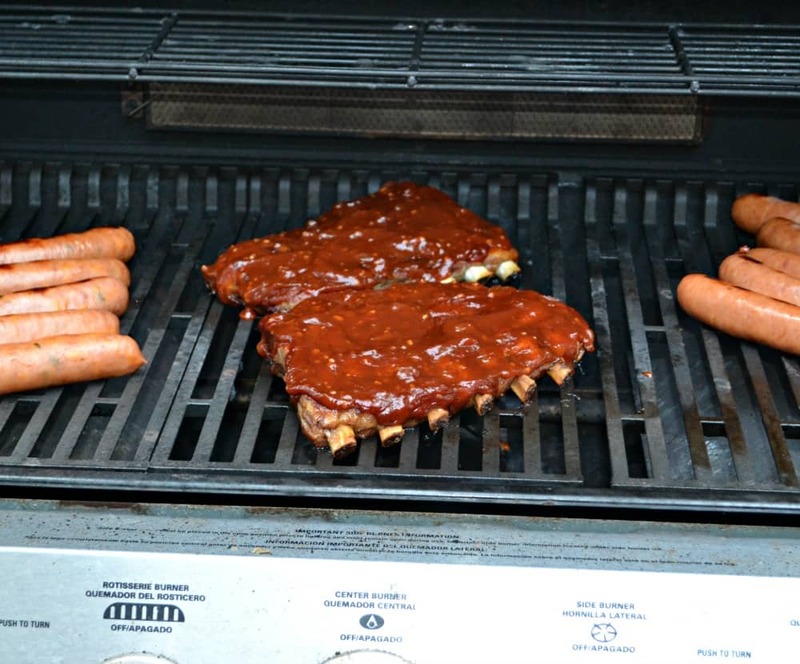 Open the grill, flip the ribs to meat side up, brush the ribs with BBQ sauce again and cook for another 10 minutes. Open the grill again and brush the ribs with BBQ sauce a third time and cook for another 10 minutes. Remove from grill and serve with additional BBQ Sauce.